LAHORE, PAKISTAN: Over 1500 women marched on the Mall, from Nasir Bagh to Punjab Assembly under the banner of Women Workers Help Line (WWHL) to celebrate the International Women Day on Monday, March 08, 2010. 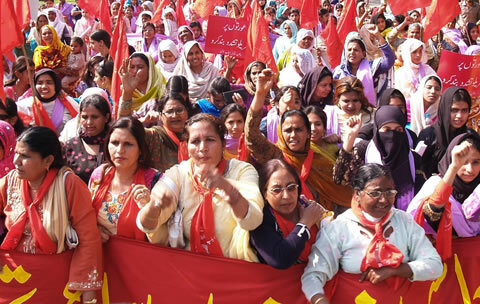 Despite prevailing fear among Lahorites after an early morning suicidal attack on FIA building in Model Town, thousands of women workers, including home-based workers, domestic workers, brick kiln and embellishment workers made their way to Nasir Bagh to observe International Women’s Day. To show solidarity with victims of Monday morning blast, WWHL canceled its segment of musical program and decided to celebrate the day in a simple manner. Participants reached Nasir bagh in small groups from different areas of Lahore. The rally started around 10 o’clock from Nasir Bagh and terminated in front of Punjab Assembly at 3 o’clock. Led by WWHL leaders, Bushra Khaliq, Azra Shad, Riffat Maqsood and others, the participants chanted full throat slogans against repressive anti-women and anti-worker laws. They held placards and banners inscribed with demands in favor of women workers. Among the participants was a large number of young girls, who were singing revolutionary songs. At the end of the rally, WWHL leaders addressed the marchers. Speaking on the occasion General Secretary Women Workers Help Line Bushra Khaliq said women workers are the most marginalized section of our society. They are facing a number of problems including social, economic repression in the shape of denial to their just rights by the sate and society. She condemned the extremist forces and capitalists joining hands to crush women rights. She also read out solidarity messages sent by various international organizations to WWHL on Women Day. WWHL Chairperson Azra Shad said women workers have dared to come out on the roads despite prevailing fear. She said women workers are deprived of fundamental rights, adding that they should be given equal wages. She urged the Punjab government to regularize the katchi abadis [informal slum housing] in Lahore. Farooq Tariq, the spokesperson of the Labor Party Pakistan addressed the participants, urging the government to issue social security cards to home-based women workers. He said women workers should be given a minimum wage of 15,000 rupees [around $180US].